This Blog post covers updates, news and various press releases regarding the new Murcia airport in Corvera. I will post as much information on When will the new Murcia airport open ? – What airlines will fly to Murcia airport? Will Ryanair fly to the new Murcia airport? Will Murcia Corvera airport replace the current airport in Murcia San Javier? What is my guess when Corvera Murcia airport will open? I normally don’t want to speculate – This is Spain, and from past experience we know that politicians work really slow here… but if even the president of Murcia says so, well it will most likely be Summer 2013. Will RyanAir, Easyjet, Jet2 fly to the new airport in Murcia Corvera? No announcement has been made yet from RyanAir or Easyjet. Jet2 will fly from/to Murcia Corvera. What will happen to Murcia San Javier airport, when the new airport in Corvera opens? San Javier airport will be closed for all private flights. Most staff will be moved over to the new Corvera Murcia airport. Only a military flight school will remain at the airport. Confirmed by a signed agreement here. When will Murcia airport in San Javier close to public not-military flights? Not yet announced. Local News report of a potential financial crisis around Corvera airport. According to “La Opinion” the airport concessionary Aeromur has stopped paying the 200 million EUR loan. Read a very good summery about the issue here. Friends, this does not look good. We keep you posted. Local Politician Pedro Cruz ( Tourism and Culture Secretary for Murcia) announces that Corvera airport will open shortly. ( according to a report here , there is a chance that we might see the Corvera airport open “shortly” ) … whatever shortly means. According to Murcias President Ramón Luis Valcárcel the airport in Murcia Corvera will be most likely be opened summer 2013 as there are still several aviation permission and installations are missing. The ministerio of Fomento ( public works ) and the ministry of transport Murcia, signed today an agreement to let AENA run the new Murcia Airport in Corvera and arrange the close down of any private flights to San Javier Murica Airport (see here). Exact dates when the closing of San Javier and the opening of Corvera will take place where not given. Jet2 – U.K. based airline with many flights to Murcia airport, publicly asks the Spanish authorities to delay the start of Murcia Corvera airport to November 2012 – to avoid huge distractions and confusion. – Makes a lot of sense in my opinion, as nobody can really plan anything for the next months, as to which Murcia airport will be open, at what months. Michael O Leary confirms, that he can’t confirm anything.. ” because nobody seemed to know what was happening yet “. After one of our last newsletters, several readers quoted sources about the current state of the Murcia airport in Corvera. While still no official announcement has been made, it all looks like February or March 2012 could be a possible opening date. After countless attempts to find out more about When the new airport in Murcia Corvera will open, I finally made it to the press department of AENA. Referring to the article below, the very friendly lady could not give me any final date for the opening of Corvera and the closing of San Javier, but she explained that the issue is still with politics to finalize and approve the decision to assign AENA with running the new Murcia airport in Corvera and half-closing the current Murcia San Javier airport. As far as any time or date goes, she could not state any specifics. Nobody wanted even to give me a rough estimate if we are talking one or many more months until the new Murcia airport will open. I will keep you all posted about this here on this page. Thanks to our newsletter reader Scott Hastings who pointed me to a publication on laopiniondemurcia.es. The Housing ministry of Spain and the Authorities of the Region of Murcia are proposing an agreement that AENA ( the spanish airport authority) will handle Corvera airport and leave San Javier airport only to be used as military airport in the future). The proposal needs still to be rectified with various institutions to be legally valid. Called Aena to get some additional information on Corvera airport. Staff at Aena’s public information phone are very friendly but totally clueless. Put me through to San Javier Airport, where lady at the phone seemed to be fed up answering questions regarding the new Murcia airport and a possible closing of San Javier. – They don’t know anything yet. Thanks for a very informative website. We have used some of the information you have provided previously to explore the area south of Murcia, as we are based in the Polaris properties at Condado de Alhama, and have found many shops and restaurants in the urbanizations between Alhama and Mazarron to our liking. 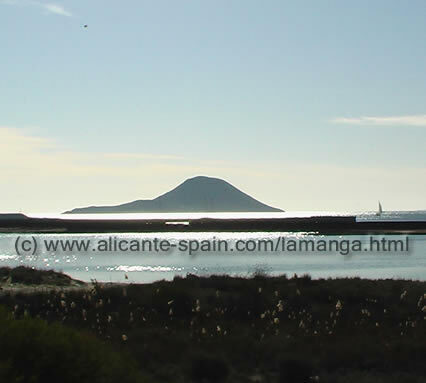 Mazarron coastline itself is a good place to explore, including the unusual Bol Nuevo. Steve, Thanks for your kind words. Always good to know if people appreciate our work. Thanks!. Regarding, Corvera Murcia airport, we heard on the news that they are starting to recruit and train personal. Depending on who you listen too, rumors are that they might get up and run mid or end of 2011. For all reader who are not familiar with Corvera airport, its the newly build Murcia airport, just south-west of Murcia. So far Murcia airport, had been Murcia’s San Javier airport which is about 50 km away from Murcia city and had some success with tourist visiting the southern Costa Blanca (Mar Menor, Torrevieja area). The new Murcia airport in Corvera is much closer to downtown Murcia. See map below. I will keep you updated here on the site, if we get to know any fix opening date on Corvera airport. If you come accross any announcement, article or press release regarding the new airport in Murcia Corvera and/or the closing of San Javier airport, please post it in our comments section, so I can update this page here to keep everybody up to date.